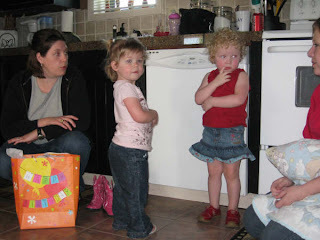 Bramell, Party of Five: Happy 2nd Birthday Becca!! Our baby is TWO today!! Happy Birthday, sweet girl. We woke up with a big squeal this morning and she screamed "TWO!" I made her favorite breakfast (scrambled eggs) and she ate them all. Last weekend we had a trip to Wynne for the Relay For Life and to visit the fam. 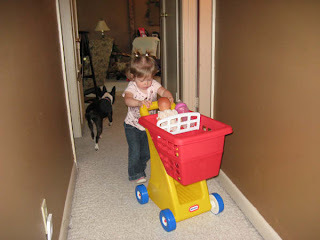 Aunt Pam gave her this cute little shopping cart for her birthday gift. She's been filling it up and pushing it all over the house all week. 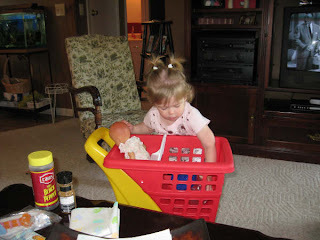 Our friends Tara and Emmy Ruth stopped by Grammy's house on Sunday to bring Becca a gift. 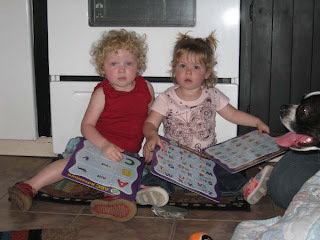 She loves the puzzles--even sharing with Emmy! Look how sweet they are! 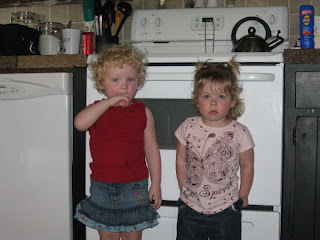 It reminds us of their mommies when we were little. I hope we get many more photos of them playing together. I'll post again later after we celebrate her birthday tonight with dinner/playtime at Chuck E. Cheese. We've never taken her before, so we'll see how it goes. We've got some fun surprises for her!! Hey....I sent Becca an e-card to your e-mail address. It is monkeys singing to her using her name (well, Rebecca, since Becca wasn't an option). I hope she likes it. It will be fun seeing y'all again on Sunday. I hope the weather won't be too wet so we can play corn toss. See y'all soon! Happy Birthday, Becca!!! Can't wait to see you again soon! I am a terrible Aunt and did not send a card but will bring it with my present on Sunday! I love the pics and can't wait to swim with BooBoo!